5) Link the field to its prompt. Click on the Tools menu and select Link Prompt. When the visual cue is activated, click on the '(L) Regulatory Agency' field dragging to the prompt. 6) Add the lookup. Click on the Push Button control in the Toolbox window, then click next to the '(L) Regulatory Agency' field. 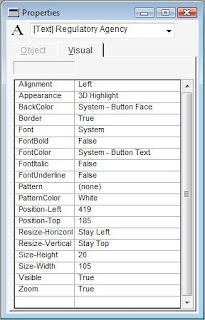 Arrange the push button to be of the same size of other lookup windows on the screen. 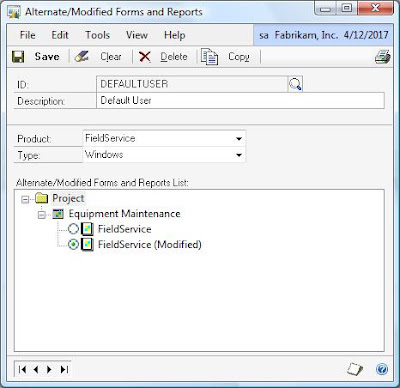 a) Double-click on the Field property under the Object tab in the Properties window. 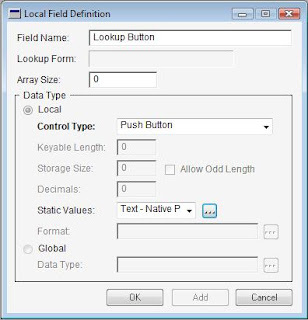 Change the field name to Lookup Button. 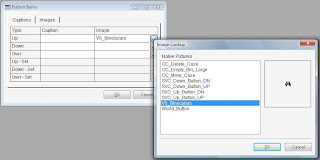 b) Select Text-Native Picture from the Static Values drop-down list. Click on the ellipses button next to the DDL to open the Button Items window. Click on the ellipses button next to the Up property and select the VS_Binoculars image from the list. NOTE: If you want the classic lookup image, you will need to add it to the Field Service modified forms picture library by copying and pasting an image from the Dynamics dictionary. c) Click Ok as many times to return to the modified window layout screen. 9) Return to Microsoft Dynamics GP and grant security to the modified window. Save all changes to your modified window on the way out. 10) Verify the window displays as intended. You can go back to Modifier to make any adjustments for field alignment or layout as needed. Our series continues Wednesday with adding all the objects and elements needed for our VBA project. 2) Click to add a Push Button control. v10 - EquipmentMaintenance.package. Contains the changes made to the equipment maintenance window made with Modifier (does not contain zoom button, I will post a download for this tomorrow). I'm trying to add a user defined 1 field from the "Global Fields" section or from a table in SQL, but can't drag the field on the layout. Anyone know how? @Anonymous March 14: If you added a text field, you will need to define your own database table to host that field. Check out the examples provided on the Learning Resources page of this blog under any of the Convergence sessions I have presented in the past. @Anonymous March 16: You cannot add global fields to any form in Microsoft Dynamics GP using Modifier. 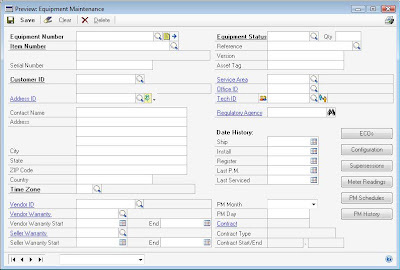 You will have to add a local field, then use either VBA or VST to drive the user interface. Take a look at the samples provided under the Learning Resources page of this blog, for the Development session presented at any of the Convergence events. Where exactly are you telling it to bring up your Customer Lookup Window? I don't see anywhere that connection is being made. I have my button, but it just does nothing when clicked because I don't know where to tell it what to open. I created a local field audit trail code in the Bank Deposit Entry module window GP. I want to be able to filter receivables here by the audit code then post. I followed your directions and they were great, how do I tie my text box to the database table CM20300?